Removing hair is time consuming, expensive and sometimes irritating to the skin. Whether you shave, wax or tweeze, it’s so frustrating to constantly try and keep on top of new growth. Some people resort to laser hair removal, but this is expensive, painful and not always effective – particularly if your hair isn’t dark. Episiva hair inhibitor cream is a botanical skin care solution that slows down hair growth from the root. Gentle on your skin it will soften and soothe while it works, making it much more pleasant to use then other hair removal methods. It contains bio-enzymatic plant compounds that weaken hair follicles by blocking nutrients from reaching the papilla cells that control growth. A clinical study of Episiva revealed excellent results – over 8 weeks participants experienced a 48% decrease in the amount of hair, a 36% decrease in growth speed and found that they needed to do 60% less hair removal. 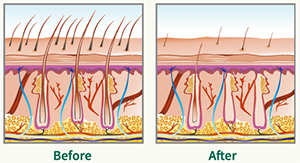 As hair grows back more and more of it will be eliminated so that you are totally free of it after around 6 months. Episiva can be used on all areas of the body, including on lighter areas such as downy facial hair. It has been dermatologically tested and is safe to use on sensitive skin.